Stay in one of 52 guestrooms featuring flat-screen televisions. Complimentary wireless Internet access keeps you connected, and cable programming is available for your entertainment. Private bathrooms with shower/tub combinations feature complimentary toiletries and hair dryers. Conveniences include desks and coffee/tea makers, and housekeeping is provided daily. Located in Glasgow, The Hawthorns is in a rural location, a 1-minute drive from Loch Lomond and The Trossachs National Park and 8 minutes from Inchailloch. 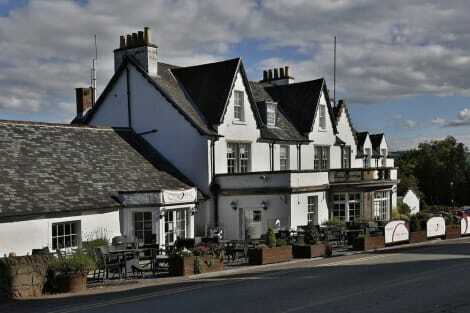 This bed & breakfast is 4.7 mi (7.6 km) from Loch Lomond and 9 mi (14.4 km) from Loch Lomond Shores. When you stay at The Winnock Hotel in Glasgow, you'll be in the historical district, within a 15-minute drive of Loch Lomond and The Trossachs National Park and Loch Lomond. This eco-friendly hotel is 9 mi (14.6 km) from Loch Lomond Shores and 4.3 mi (6.9 km) from Inchailloch. This town is the home of the Drymen Red Bus Company, which provides regular private guided tours of Scotland, taking visitors to witness some of the most photogenic landscapes in all of Europe, if not the world. One of the main sights in the area is Buchanan Castle, which was built in 1854, although the roof was removed in later years. Today, the landmark overlooks the popular Buchanan Castle Golf Club, which is one of the most picturesque golf courses in the country and benefits from easy access to Drymen hotels and restaurants. Scotland's oldest registered licensed pub, The Clachan Inn dates back to 1734 and is renowned for its delicious Scottish cuisine and comforSEOSITE_LEVEL_DESCRIPTION, elegant accommodation. The pub, which is translated as 'a building of stone', was once an important storage space for large amounts of salt, when the mineral was taxed. Whether you're interested in booking an organised tour or travelling independently by car, try to allow some time to admire the spectacular panoramic views of Loch Lomond, a sight to behold whatever the weather. Drymen also benefits from good transport links to Edinburgh and Glasgow, and is within easy reach of several other attractive lochs such as Loch Long and Loch Earn. A short drive from the town is the charming Carrick Castle, which dates back to the 15th century, although a defence may have existed at this site before the Norman Conquest. If you're looking for an authentic country-themed hotel for fantastic value for money, choose the Winnock Hotel at The Square. Other popular accommodation establishments in the vicinity include the affordable and highly hospiSEOSITE_LEVEL_DESCRIPTION Kilmaronock Manse Bed & Breakfast, and the stylish, welcoming, yet budget-friendly Ashbank Bed & Breakfast.